Host a tasty and interactive dinner party in six easy steps. 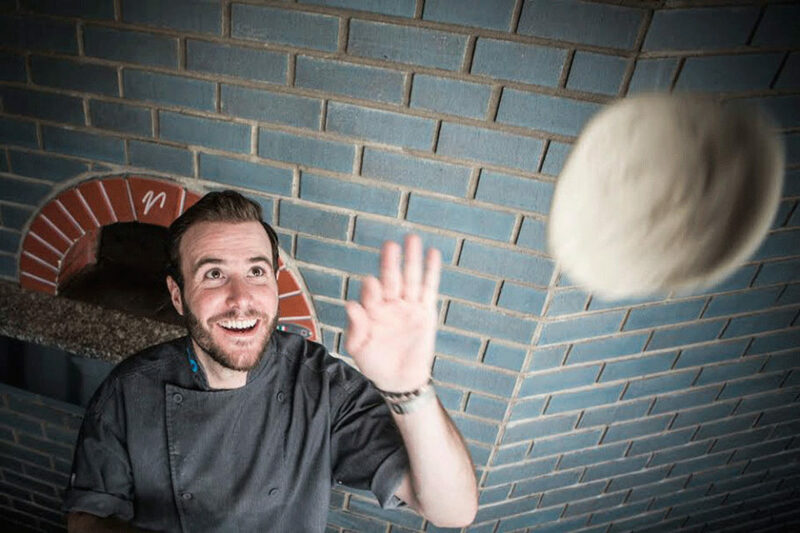 Chef Robert Jewell expertly spins dough at Double Zero. Photo by Alex Ramadan. The lights are low, I’m sipping on Cocchi Americano and I’m watching chef Robert Jewell twist pizza dough around his wrist until it lengthens and flattens out. It’s a Thursday night and the executive chef at Double Zero is giving us a private lesson on pizza making. Chef Robert Jewell has years of experience in making pizza pies and takes his calling seriously. He’s even hosting a cooking show, A is for Apple, on Gusto TV. Robert is talking to the group, and stretching the dough out around his hands while never breaking eye contact. Meanwhile, I’m worrying about flipping the dough and not overdoing it on toppings. Believe it or not, the pizza making is easier than it looks, and if you follow the expert tips below, you can throw your own pizza party. If you follow chef Jewell’s tips, making pizza at home is easier than you might think. If you’re going to host a pizza party, you need to do some planning because the dough needs to sit for at least a full 48 hours before you use it. Not to mention, you must have a well-stocked bar for the requisite cocktails and wine pairing. When you’re working with your dough, you need to bring it to room temperature. You should never put cold dough in the oven as it will burn faster. When you’re laying the dough out, you need to press it out from the centre until it reaches a radius of 6-8″. Then, the flip. You should pick up the dough and start tossing it from hand to hand, using a flipping motion like you’re checking the time on your watch. The best pizza makers pride themselves on having the thinnest crust possible. Too few toppings and the pizza will be bland and dry, too many and it’ll actually prevent the pizza from cooking properly and make it soggy. Also, it’ll give it a ‘gum line’ which is a term you’ll likely never use other than in this context. So spread the toppings out evenly, and remember, less is more. If you have a pizza stone to cook on, use it. If not, a lightly oiled baking sheet is the way to go. Cook the pizza at 500F but using the bake setting only, this is not a broiler situation. Rotate the pizza 180 degrees every three minutes. Cook it on the top deck for the of the time and then move it to the bottom for the rest of the time. Every oven is different so watch those puppies. Once the pizza has browned, the cheese has melted, and the toppings are bubbly, you’re ready to go. It’s important to be ready to serve your pizza as soon as it comes out of the oven. If you have any fresh ingredients you want to add, do so after the pizza is out of the oven. Any fresh greens, herbs or extra Parmesan should go on now. We had a professional guiding us at Double Zero, not to mention wine pairings and refills, but if you run with some of these tips, you can throw a successful and splashy pizza party in your kitchen.